A miraculous up and down early on from Bryson DeChambeau helped the world No 6 beat Russell Knox in the opening group encounters in the WGC-Dell Technologies Match Play in Texas. DeChambeau, who has recorded five title triumphs since failing to qualify for this event 12 months ago, won the Group 6 tie 3&1 after getting out of jail at the par-3 fourth hole at Austin Country Club. The American’s tee shot hit off rocks at the front of the green, sending the ball high into the air before landing in thick grass in a deep gorge. He found it just before the three minutes now permitted for searching were up and played an outrageous shot, getting it to around 15 feet before rolling in the par putt for an unlikely half to keep the match all square. Knox was left shaking his head as the pair moved on to the next tee, with DeChambeau admitting afterwards that he hadn’t expected to pull off such an amazing recovery. Knox, who needs to make it to the semi-finals to secure a spot in The Masters in a fortnight’s time by climbing into the world’s top 50, opened with six solid pars before getting his nose in front with a two-putt birdie at the par-5 seventh. The Invernesian then lost the short eighth to a par after a three-putt before regaining the lead with a birdie from around 10 feet following a lovely approach into the ninth. It was a case of deja vu, though, as that advantage disappeared straight away, this time to a birdie as DeChambeau rolled in a long putt at the 10th before he then made a two at the next to leave Knox trailing for the first time in the match. Knox was unlucky to see his second shot at the par-5 12th run through into water at the back of the green after landing it in the heart of the putting surface. He escaped with a half in par, but DeChambeau birdied the long 16th to go two up and it was all over when Knox left his second shot in a greenside bunker at the penultimate hole. The defeat leaves the Scot with an uphill a battle as only eight players have advanced out of the group stage in the event following a first-day loss. He now meets Australian Marc Leishman, who beat Thailand’s Kiradech Aphibarnrat in the other Group 6 match. Taking up where he left off in the Ryder Cup last September, Open champion Francesco Molinari made a winning start, as did Tommy Fleetwood, his partner in crime on the opening two days in that thumping victory over the US in France. 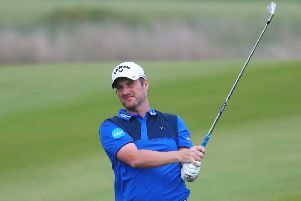 Molinari, who won five out of five matches for Thomas Bjorn at Le Golf National, was always in the driving seat as he beat Japan’s Satoshi Kodaira 5&4 while Fleetwood came from two down after seven holes to triumph 3&2 again Korea’s Byeong Hun An. On a brilliant day for Europe’s Ryder Cup heroes, Ian Poulter, Justin Rose, Paul Casey, Thorbjorn Olesen, Henrik Stenson, Jon Rahm, Rory McIlroy, Tyrrell Hatton and Sergio Garcia also opened with wins. In fact, with all 12 of the victorious side in action in Texas, Alex Noren was the only one to suffer a disappointment as he suffered a heavy defeat to China’s Li Haotong. Dunhill Links champion Lucas Bjerregaard pulled off an upset as he beat world No 5 Justin Thomas 3&2 while other first-day winners included three-time champion Tiger Woods, world No 1 Dustin Johnson and a rejuvenated Jim Furyk.